The Alhucemas is part of the Balearia + series which comprise the finest ships in the Balearia fleet. 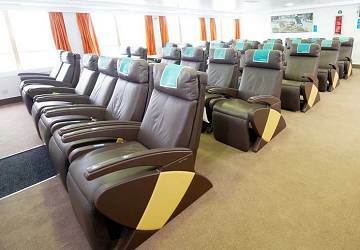 A fast, green and modern ship, the Alhucemas features a bar, cafeteria, numerous cabins, a children’s play area, left luggage lockers, a reserved seating lounge, an onboard shop, solarium and swimming pool. 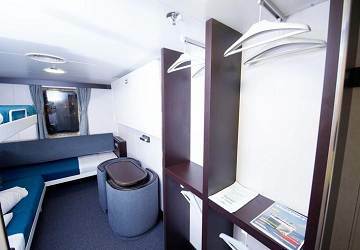 Alhucemas ferry has around 46 4 berth cabins, 6 double cabins, 2 suites with 2 king size beds and 2 double cabins adapted for passengers with reduced mobility. 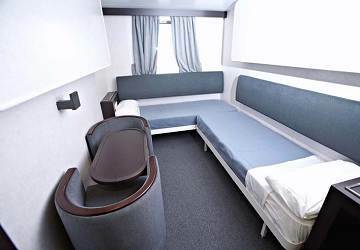 All cabins are air conditioned with wardrobes, fully fitted bathrooms and an anti-allergy cleaning system. Pre-reserved seating is available in the spacious and private 'Neptune' Lounge which features fully reclining black leather arm chairs. Standard arm chairs available in the 'Sirena' Lounge. 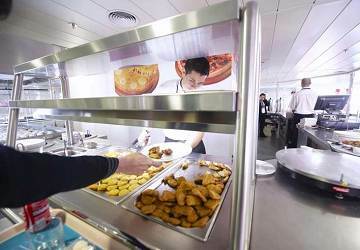 Onboard you'll find a self service restaurant offering a classic buffet, pasta and pizza. There's also a burger bar. In the summer months there is a bar on the outdoor deck near the pool. 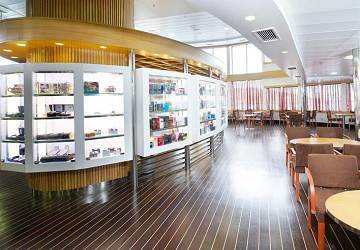 The Alhucemas features an onboard shop where you can buy a range of cosmetics, perfumes, sweets, travel essentials and gifts. 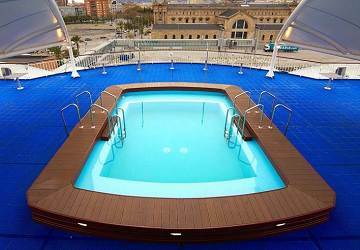 In addition to a swimming pool with deckchairs, a solarium and numerous relaxation areas, Alhucemas offers an Ipad rental service (approximately €2 for 2 hours; €5 for 4 hours). Children are well catered for onboard with a dedicated children's play area. Lifts connect all the passenger decks too. Please Note: Whilst we have taken great care in making our Alhucemas guide as accurate as possible, onboard facilities, services and entertainment may vary depending on the date and time of year that you travel, facilities mentioned may change without notification and ferry companies reserve the right to operate vessels other than those mentioned at time of booking without prior notification. It was a great voyage, comfortable and pleasant in every way! Thank you! "Perfect answer for Mallorca to Ibiza"
No matter if you bought the ticket for a particular day and a particular time with Balearia, Acciona, FRS or any other company. When you arrived to Tangier Med, neither schedule nor shipping companies are respected, everybody has to queue in the same single line to wait a ferry to board. Among customs formalities and waiting time took over three hours. After sailing, dock in Algeciras port (which is not the third world) two ferries almost at the same time and disembarked approximately 500 cars with 2,000 people on board, spanish authorities competent (or incompetent?) only habilite to enter the European Union four customs control, so it takes two hours to go through passport control. I do not think it can be organize an operation worst Crossing the Strait in worst way. "baleria - algeriras to tangier med"
1.ferry was delayed by an hour. 2.very little information was given by staff who didn't speak any English. 3.email sent by direct ferries was not accepted by staff who eventually issued a ticket!! "comentary about last travel from Tanger to algeciras"
It was very satisfactory travel with Balearia from Algeciras to tanger, the ferry in good condition above all the one on the return very comfortable,clean and fast.The only negative thing was the delay.Anyway my valuation is positive for the crew very kind and professional. 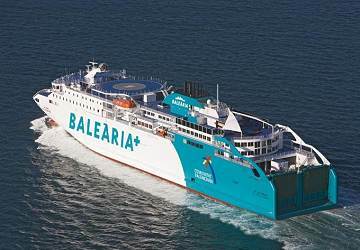 I recommend the crossing of the Strait with Balearia. 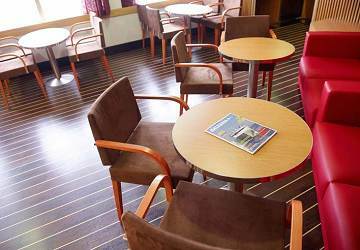 The ferry is very comfortable and with very good amenities and the staff very friendly. We live in Andalucía and decided to take a holiday in Ibiza, taking our own vehicle. 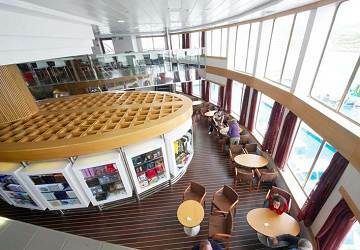 The whole ferry experience was well managed, from boarding, to the service in the bars and restaurants, to disembarking. The pool bar during the day is a fantastic place to sit and read and have a drink and some freshly-grilled food. 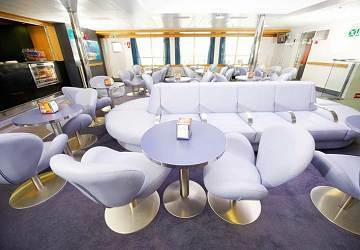 If the crossing is in the evening there are lots of places to sit with comfortable allocated seating or tables in the cafes and bars. It beats flying, anyway. We'll be doing it again. "Journey Dénia - Ibiza July 17, 2014"
The boarding of the cars is very quick. The crossing is perfect. We didn't try the food. We had a good trip between Mallorca and Ibiza on Balearia. The ship was comfortable and very easy to find, board and be seated. Lots of facilities on board to keep you occupied. Staff were friendly and helpful and the ferry was on time for departure and arrival. Would much rather this than air travel. "A journey between PALMA and IBIZA"
The seat of Neptuno's class are very confortable. The crew is nice but the air conditioning is a bit instable and the television too loud ,but for other highly recommended. We indeed went to Ibiza and back on the Alhucemas. 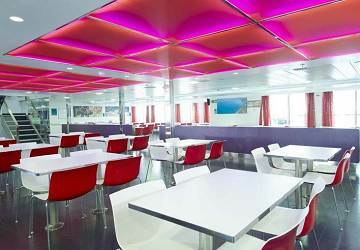 Firstly: our experience with DirectFerries was fine! The ship was old but our stay on board was fine. Our only remark is that the slow boat takes 3.5 hours, whereas the fast boat onbly takes 2. Arrival and departure times are correct. It's possible to have a meal and use WiFi (extra charge) aboard. Boarding and disembarking takes some time. The complete experience, also to Mallorca on a fast boat before, is fine!